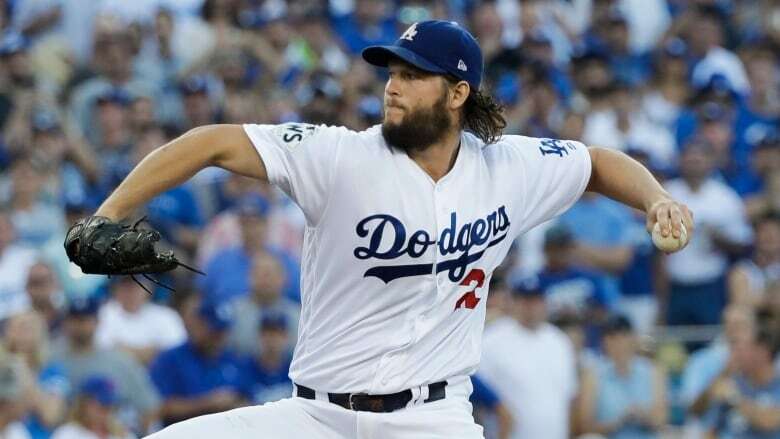 Clayton Kershaw is staying with the Los Angeles Dodgers, agreeing to a $93 million US, three-year contract that avoids free agency. Clayton Kershaw has heard the chatter that he's in decline. He's eager to prove the doubters wrong while wearing a Los Angeles Dodgers uniform. "There's been a lot of people saying that I'm in decline or not going to be as good as I once was," he said. "I'm looking forward to proving a lot of people wrong with that." "I wanted to stay here, so financial, everything aside, it was more valuable to me to just stay here," he said. Kershaw gets an additional $28 million in guaranteed money. The new agreement includes $4 million annually in performance bonuses, in four $1 million increments for 24, 26, 28 and 30 games started, which could raise the deal's value to $105 million over three years. Kershaw, his wife Ellen and their two young children make their off-season home in the Dallas area, and if the Texas Rangers had had a winning season "it would have been something to consider for sure," he said. "It really wasn't as much of a question for me this time around," he said. "My kiddos love it here. Ellen loves it here. I love it here. I love the team here, and there's not many opportunities that meet all the criteria that Ellen and I would be looking for. And myself personally, a chance to win every single year, it doesn't come around like this in LA very often." Winner of the NL Cy Young in 2011, '13 and '14, Kershaw was limited to 26 starts this year because of a back injury and went 9-5 with a 2.73 ERA while striking out 155. The Dodgers lost in the World Series for the second straight season, with Kershaw taking the loss in Sunday's season-ending Game 5 defeat to Boston. His average fastball velocity dropped by 2 mph in the past year to 91 mph. "I plan on getting back to that level that I was at," he said. "There's a lot of guys older than me, and there's a lot of guys with more innings than me in the big leagues that are still maintaining their velocity." "No more DL time," he said. "From there, hopefully the getting people out thing will take care of itself." "While I did have a little bit of a back issue this year, it wasn't very significant. I missed more time this year because of the shoulder," he said. "I really believe that for three years I can be just as good as I ever have been. And I'm not saying I can't be good past that. But that's as long as I was willing to commit to right now." Kershaw has a career 153-69 regular-season record with a 2.39 ERA in 318 games but it's in the post-season where his numbers drop. He's 9-10 with a 4.32 ERA. He gave up four runs in seven innings in Game 5 of the World Series. "Winning is still the most important thing for me," he said.